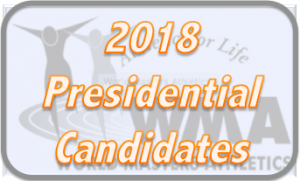 As the three candidates seeking election as President and World leader of Masters Athletics for at least the next four years, set out their stall in front of the voting Delegates at an open Forum last night, each faced a barrage of questions from the Delegates on their plans for the future of WMA, relations with the IAAF, finance, regional development etc. 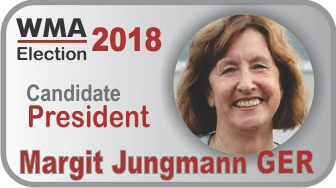 Margit Jungmann, Germany, the current Vice President, a German, French and English speaker and a Teacher, has been a Delegate at WMA Championships since 2007. If elected, she will become the first female leader of World Masters Athletics. 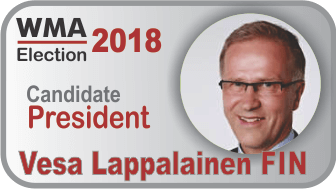 Vesa Lappalainen, Finland. Speaks Finnish, Spanish, English, German and Russian. He retired at the end of 2017 from the position of Managing Director of Finland Masters Athletics. He has been the Finnish Masters National Team Manager at Championships since 2002. Gary Snyder, USA. 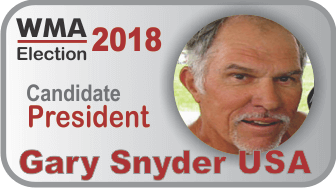 He was the National Chair of USATF Masters T&F from 2006-16 and was a Member of USATF Board of Directors from 2006-2010 and is an active member of WMA Executive VP Committee. He retired as Chief Financial Officer AT&T associated companies in 2008. Delegates will now vote at the General Assembly on 8 September for their preferred Candidate to lead the burgeoning and wonderful world of Masters athletics and we take this opportunity to wish them every success in this very demanding role.